The world of Tove Jansson’s Moomins is charming, kind, and full of strange and unique characters. Beginning life as a series of books and comic strips in the 1940s, the Moomins’ world has branched out into the realm of animation – in both two-dimensional traditional animated films and stop-motion “fuzzy felt puppet” animation. 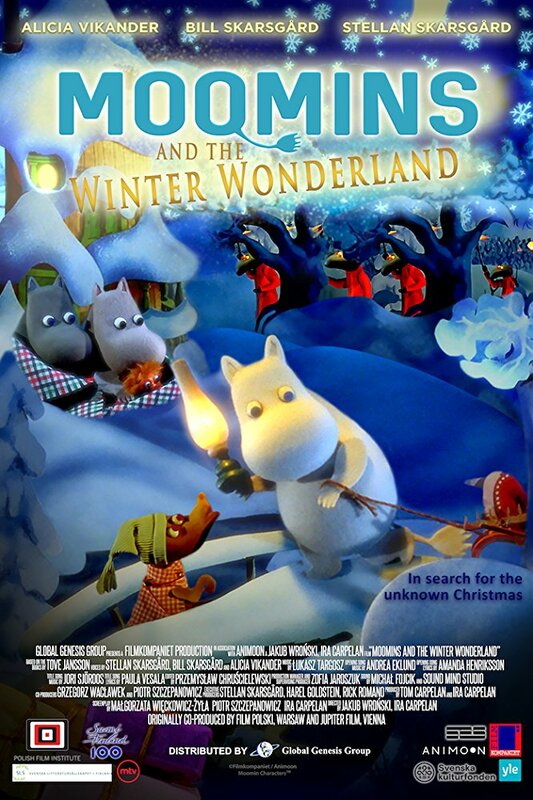 From its stop-motion incarnation, the story of Moomins and the Winter Wonderland brings this lovely, quiet little world into the modern age with a cozy, joyful tale – and it does so in a surprising way. The Moomins television series, which spanned from 1977-1982, has been sectioned into series of episodes, which are fully restored and then released, as full-length features, with new soundtracks. The “Moominland Midwinter” block of episodes comprise this film, and without any sort of “rebooting” of the art, or making the series something it never was, today’s children may delight in the same stories as did the generation before. The story told originates with Jansson herself; the seventh in her series of Moomin books, it was first published in 1957 under the Swedish title Trollvinter. The Moomins are a family of adorable, hippo-like creatures that live happily together in the Moomin Valley, where they and their friends have fairly simple little adventures and teach the importance of togetherness and harmony with nature. Moominpappa, Moominmamma, and their son Moomintroll begin the cycle of winter tales by gathering mushrooms and making preserves, collecting firewood and preparing for their hibernation. Moomintroll laments that he must remain in “wintersleep” while his best friend Snufkin leaves the Valley and wanders the world in search of adventure, not to return until the spring thaw. But when he awakens from a nightmare, Moomintroll notices that the winter nights are full of cold beauty, and decides to remain awake and share the season with his family and friends. 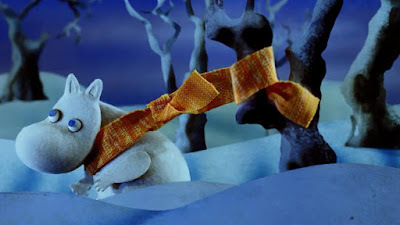 The animation, typical of European stop-motion in many ways, brings these familiar characters to life with warmth, finding them discovering the wonders of winter in starkly beautiful backgrounds. Vignettes of various characters tie together as the residents of Moomin Valley learn about an approaching visitor called “Christmas”, nervously and excitedly preparing for its arrival. Its pace is slow and gentle, opening up the familiar through the eyes of Moomintroll, who has never been awake to play in the snow, or see the Northern lights, or build a Solstice bonfire to entice the sun’s return. Because this film is essentially part of a television series however, it relies on the viewer’s familiarity with these characters. A few are introduced for the first time as Moomintroll meets them, but for those who watch the full-length feature without having seen any previous Moomin material, it can get confusing figuring out some of the characters’ relationships to one another. But for those patient enough to meander through the Moomin world at its own pace, the reward is a truly lovely little group of stories, during which an innocent character begins to see his world during a time of hardship and confronts his hidden loneliness and fears. For children who are used to the overstimulation of boisterous, fast-paced animation so prevalent in television in recent years, the tranquil Moomins may seem boring – but for those seeking a quiet reprieve in genuinely artful stop-motion, and gentle introspection through a childlike perspective, it is truly wonderful to know that these cherished characters and their stories are still being lovingly brought to the screen without attempting to modernize them or redesign them into something they are not.